What's a girl to do when she's secretly in love with a friend and he's married to someone else? She gets over it. That's what Amy Parker has done. Rather than lose her best bud Quinn Whitfield with an ill-timed, crazy confession of affection, she's taken the smart route. She's eased away from him. Just enough to get past the unrequited bits. And you know, it's working.Until the day Quinn announces he's now single. That's right. He's single. And he wants to hang out. With her. Get reconnected the way they used to be.Oh, this is so not good for Amy's equilibrium. Daily doses of Quinn remind her of everything she loves about him. But if he's free…and she's free…well, maybe the time has come for one of those crazy confessions. http://Sassafrass.booklikes.com Sassafrass 4.0 Liked it but these characters made me crazy! text Liked it but these characters made me crazy! Really cute, but I would have preferred more heat. I guess Harlequin still isn't quite for me. I found this oddly depressing though well written. The emotions felt much too one-sided and the OW was far too sympathetic for me to really believe the HEA. 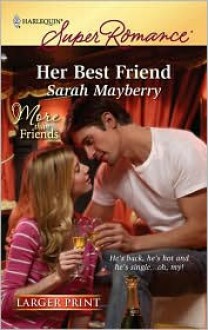 A good friends-to-lovers story with a heaping dose of unrequited love (by the h for the H) tossed into the mix. I liked it, but I also thought the characters were kind of...bland. 3+/3.5 for the quality writing and the realistic storyline.